Authorities said the man had an "unprecedented scale" of arsenal at his home. 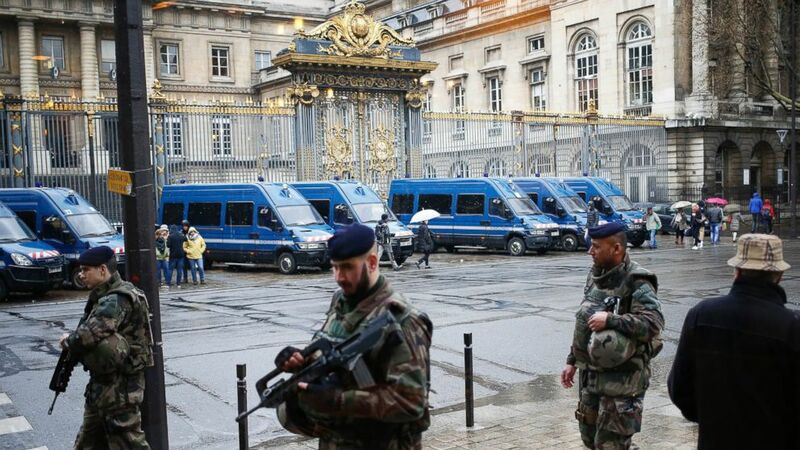 A French national arrested outside Paris days after the Brussels terror attacks has been charged with a string of terror offenses for allegedly plotting an "imminent attack," Paris prosecutor Francois Molins said Wednesday. Molins said the suspect, Reda Kriket, had an "unprecedented scale" of weapons including Kalashnikovs, explosives and detonators. He is accused of participating in a terror group, preparing an attack, possessing and transporting weapons, manufacturing explosives and possessing fake documents. The prosecutor also alleged connections between Kriket and at least three other people who have been detained in recent days in connection with terrorism. One man was arrested in the Dutch city of Rotterdam and two others in Belgium. An arsenal of "unprecedented scale" of weapons and explosives was seized in Kriket's home, Molins said, adding that the weaponry was evidence of an "imminent attack." (Francois Mori/AP Photo) French soldiers patrol outside the Paris hall of Justice, March 30, 2016, while Frenchman Reda Kriket is being questioned by a magistrate. Authorities allegedly found five Kalashnikov rifles, seven smaller weapons, TATP (the explosive used in the Paris and Brussels attacks), detonators, acid, nitroglycerin, various equipment that could be used to create explosives and ball bearings. Investigators also found seven cellphones and two computers. Kriket was charged in abstentia in Belgium last summer for allegedly recruiting jihadists and sending them to Syria. His arrest was the result of an investigation that opened in November after an unidentified man was arrested and deported from Turkey. When authorities sought to determine the man's connections, they came up with two names: Kriket's and a man named Anis Barri, who Molins said was the man recently arrested in Rotterdam, officials said. Kriket and Barri left for Syria somewhere between the end of 2014 and the beginning of 2015, Molins said. Since their return, they have been suspected of traveling between France, Belgium and Holland. Arrest warrants were issued for Kriket on Jan. 14 and for Barri on Dec. 24. Barri has been fighting extradition to France since his arrest in Rotterdam. Authorities found Kriket after a car owned by Barri and under surveillance, left Argenteuil, France for Belgium on March 11. Kriket was driving that car, Molins said. He was located on March 23 and arrested the next day in the town of Boulogne Billancourt. Kriket had been paying cash every month for an apartment in Argenteuil, which he rented under a false identity. (Etienne Laurent/EPA) A police officer stands outside a building where an anti-terrorism operation took place in Argenteuil, near Paris, March, 25 2016. 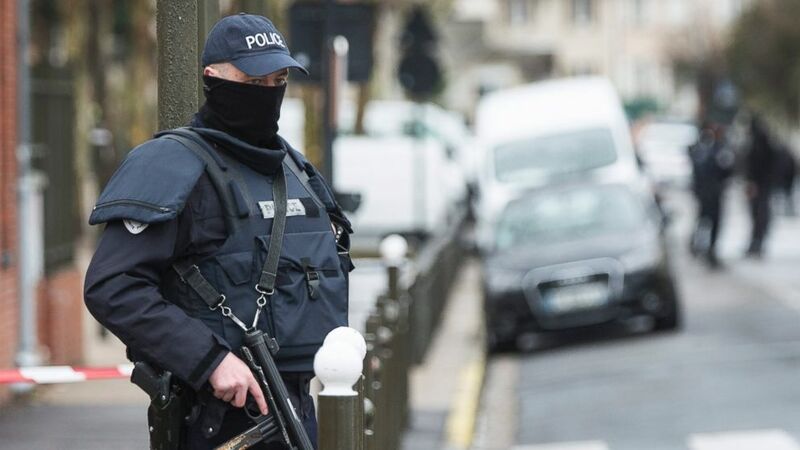 Molins noted that Belgian authorities have detained two other men, identified as "Abderrahmane A" and "Rabah M." They are currently under investigation. Kriket will remain in custody until his trial, the prosecutor said. He has denied to authorities that he is a terrorist and said Barri was storing items at his apartment.